Ametek has developed a patented cooler/absorber for stripping aggressive gases (HCI, SO2, etc.) from chemical or refinery process streams. The versatile design functions like a column with the tubing acting as temperature-controlled packing that can add as well as remove heat. The new design uses clusters of small-diameter tubing made from Ametek’s “Q” resin, a patented thermally conductive compound based on Teflon® PFA fluoroplastic resin and graphite. In a typical installation, 1860 tubes measuring 0.125 in. 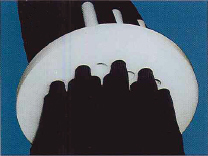 (3.2 mm) in diameter by up to 25 ft. (7.3 m) long are vertically disposed in a steel column lined with Teflon® PTFE fluoroplastic resin. Cooling water flows upward through the heat-conductive tubing. 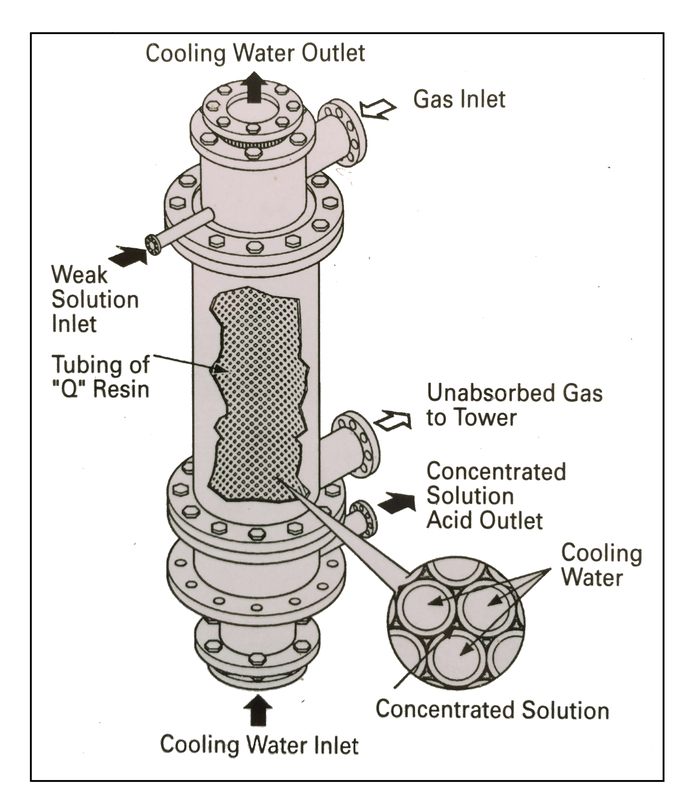 Gas and droplets of water or another absorbing medium flow downward through the column, outside the tubing. The gas dissolves in the absorbing medium, which collects on the outer tubing wall. The heat of solution is absorbed through the wall by the cooling water. Clusters of thermally conductive tubing. Ametek says that its units take less space and cost less than conventional designs because “Q” resin has double the thermal conductivity of unfilled fluoropolymers. Ametek reports that its cooler/absorber provides more resistance to thermal and mechanical shock and fouling, and requires less maintenance than traditional graphite units. Teflon® PTFE and Teflon® PFA meet needs for broad chemical resistance. Teflon® PFA allows compounding for conductivity and extrusion as small diameter tubing. Please contact Ametek for more information on their product line and manufacturing capabilities. AMETEK Fluoropolymer Products specializes in highly corrosion resistant, high purity, and high temperature products to serve the chemical processing, metalworking, semiconductor, aerospace, and other industrial applications. Its core products are based on Fluoropolymers, silica and phenolic resins and are marketed under the following trade names: Fluoropolymer Heat Exchangers, Fluoropolymer Tubing, Fluoropolymer Pipe, Havaflex® Ablative Products, and Flexsil® Molten Metal Filters. Combines ease of processing with similar properties to Teflon™ PTFE.